Raith Rovers have suffered a fresh injury blow in attack ahead of the top of the table clash against Arbroath. Striker Chris Duggan has picked up a similar groin injury to the one that kept him out previously and is expected to miss Saturday's showdown at Stark's Park. 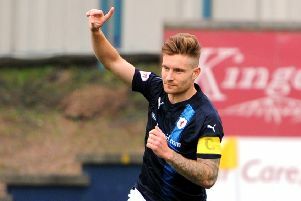 The 25-year-old has endured an injury-hit campaign, managing just five league starts since moving from East Fife in the summer. Confirming the news, Raith boss John McGlynn said: "It looks like the problem has flared up on the other side. "I think he could be missing, certainly at the weekend, and maybe for a few weeks. "With Lewis Vaughan injured long-term, Dan Armstrong away, and now Chris out, that's taking goals out of the team. "It doesn't help but we've had injuries all season and we'll just get on with it." Top scorer Kevin Nisbet was substituted during the Scottish Cup defeat to Hibs on Saturday with a tight hamstring but is expected to be fit to face Arbroath.